EU PROGRES Manager Graeme Tyndall today visited Novi Pazar to mark the completion of four projects, worth 332,900 EUR, which were funded by the European Union and the Government of Switzerland through the European Partnership with Municipalities Programme EU PROGRES. 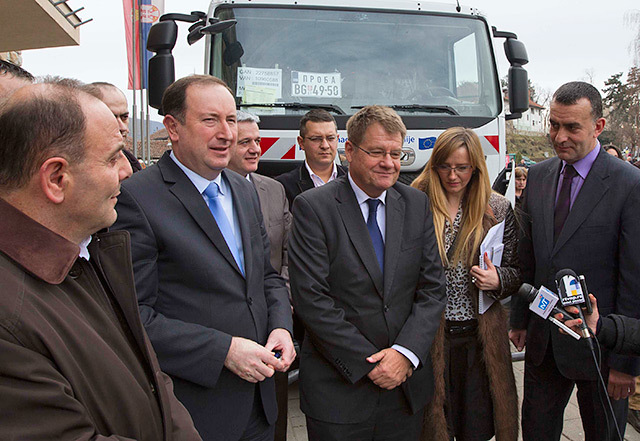 Tyndall handed over a modern water tank truck to Novi Pazar Mayor Meho Mahmutović. 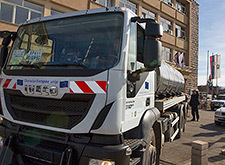 The main purpose of this truck, which will be used by the Public Utility Company “Čistoća”, is to fill the potable water reservoir in the Blaževo settlement, the construction of which is to be completed in March 2014. The water tank truck will also be used to supply other parts of the city with water and for cleaning the streets. 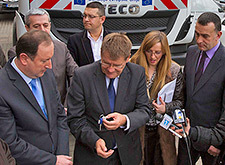 The purchase of this truck, which cost 97,600 EUR, was funded by the European Union and the Government of Switzerland via EU PROGRES. 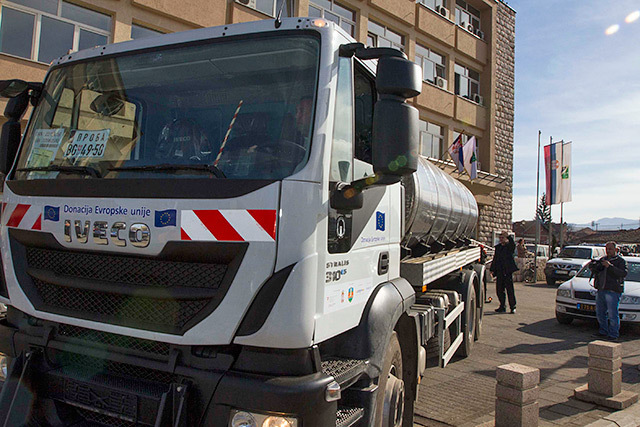 “This is a continuation of our efforts to provide quality water to Blaževo, because access to potable water is one of the fundamental rights of all people. This is why the European Union and the Government of Switzerland have earmarked a total of 270,000 to fund this project through EU PROGRES, the implementation of which includes the construction of the reservoir and the purchase of the truck,” Tyndall said. 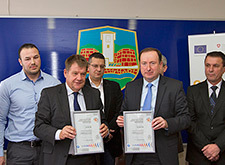 The EU PROGRES Manager also handed over to Mayor Mahmutović Quality Management System (QMS) ISO 9001 and Environmental Management System (EMS) ISO 14001 certificates. The City of Novi Pazar is one of the five local self-government in the South and th South West Serbia that adopted these standards and their application will improve the speed, efficiency and quality of their services to the citizens, clearly define the powers and duties of the local government staff and help cut their administrative costs, improve the transparency of their administrations and shorten their procedures. “Novi Pazar has continuously been striving to be a modern city responding to the needs of all its residents. 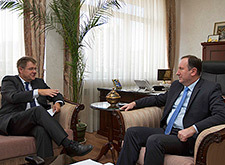 These standards will help us improve our efficiency and minimise the mistakes in our work,” Mahmutović said. 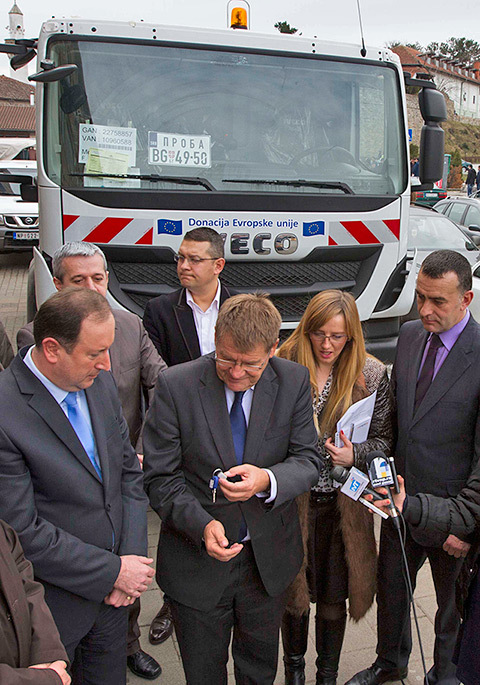 During his visit to Novi Pazar, Tyndall also handed a van for the transport of beneficiaries over to the Regional Centre for Persons with Mental Disabilities in Novi Pazar, thus marking the end of this 30,000 EUR project of equipping the Centre. “We have helped the Regional Centre get the infrastructure it needs to operate normally through several projects and I hope that the local self-governments will realise how important the Centre is and earmark enough funding to allow it to continue working without hindrance,” Tyndall said. The EU PROGRES Manager also visited the Lukare Local Community, where the project involving the renovation and equipping of the Local Community office was completed. The residents of this settlement can now obtain their birth certificates and have their documents certified immediately. “A good and simple administration is prerequisite for development and this Local Community office is one of 16 such offices renovated and equipped with the 26,500 EUR the European Union and the Government of Switzerland allocated via EU PROGRES. The residents of these settlements will no longer have to go to the City Administration and wait in line in the Vital Records Department, they can get their business done in their neighbourhood,” Tyndall underlined.